Saturday, October 6, 2018 at 12 pm, while the Sea Rescuers of the station SNSM Auray - La Trinité return after a rescue exercise, they are called for a boat participating in the challenge Safran who dismasted with 8 people on board . "When we arrived, the 8 crew members of the boat were on deck, a boat from the race organizing committee and two RIBs were nearby," explains Patrick Le Pluart, boss of the rescue boat. SNS 158 Eric Tabarly . In front of the rescuers, the mast, visibly broken in several pieces, went under the boat for its deepest part. The mainsail and the Genoy join the whole thing. 5 rescuers are then transferred to the boat whose drift is stopped by anchoring. Among these 5 rescuers, two lifeguards from the Nantes training and intervention center (CFI): Corentin and Laure, who came specially for the rescue exercise preceding the distress call. For nearly 2 hours, the 5 crew members are working to recover sails and pieces of mast that are still connected to the boat. 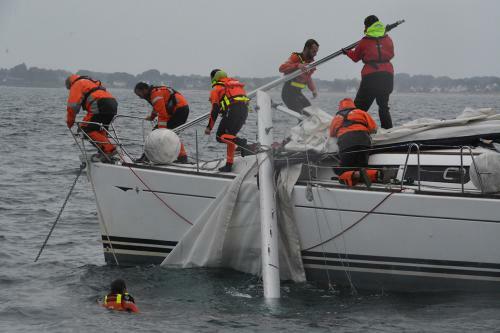 Rescuer swimmers have not hesitated to put several times in the water to facilitate the recovery of the sails and to ensure the fixing of ends on the submerged parts of the mast," reports Bertrand, observer CFI Lorient, also to edge of the boat. With care, the whole mat (in several pieces) is fixed along the boat to allow a return to port with the least possible loss. At 1430, the damaged boat was able to restart her engine and return to the port of La Trinité-sur-Mer, escorted by SNS 158 volunteers. A beautiful operation in a remarkable cohesion between onboard lifeguards and lifeguards, used to evolve on beaches.